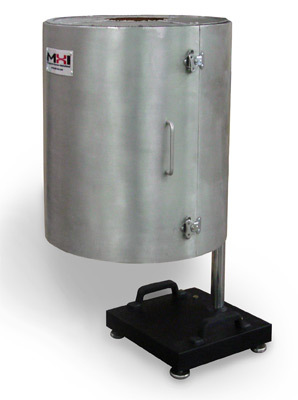 MHI Vertical and Horizontal Split Tube Furnaces are the most versatile laboratory testing furnaces and offer the best value for mechanical testing at different temperatures with very slow to very rapid heat-up rates. Our Vertical Tube Furnaces now feature double-walled stainless steel shell construction. Choose either complete split furnace and controls or furnace modules. For a more information, Contact Us. Enclose, hang or support parts in the furnace. Ceramic tubes available as option. Generally used for materials testing. A must for every laboratory. For extensometer slot. Please contact for details. All MHI tube furnaces feature rugged double-walled stainless steel construction, electronic controls capabilities and MHI's highly acclaimed heating elements. Our vertical tube furnaces feature continuous operating temperatures of up to 1760°C. Because of their versatility, MHI's furnaces feature a number of uses. Our vertical tube furnaces have found a number of applications due to their veratility. With very slow to very rapid heat up rates, VSTs can be configured for most applications. Because each application is unique, Contact Us to discuss which product best fits your needs. 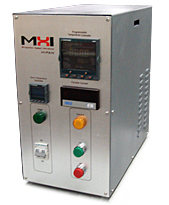 MHI offers two types of controls with our vertical split tube furnaces. Programmable electronic control panels come standard with most models. MHI DACS software offers furnace controls, step programming, logging and a number of other features, and is compatible with most MHI furnaces.